A benzazepine derived from norbelladine. It is found in galanthus and other amaryllidaceae. 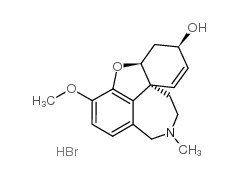 Galantamine is a cholinesterase inhibitor that has been used to reverse the muscular effects of gallamine triethiodide and tubocurarine, and has been studied as a treatment for Alzheimer’s disease and other central nervous system disorders.